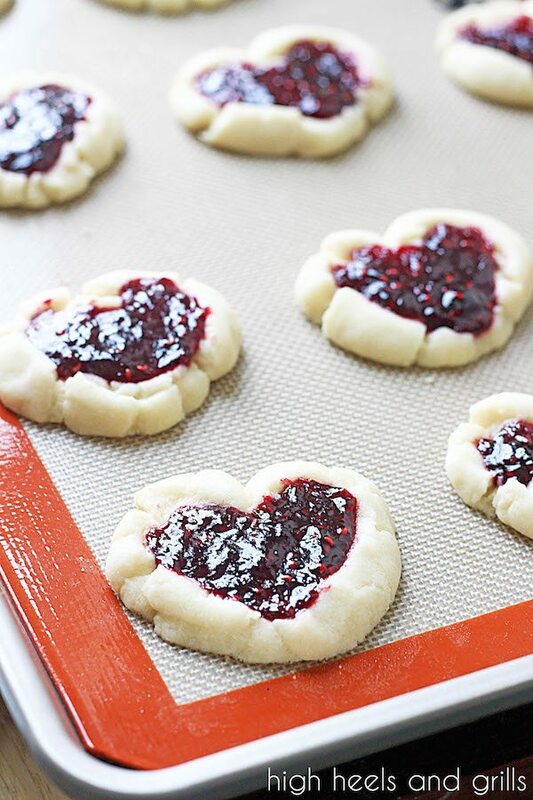 Say hello to these buttery and delicious, Raspberry Thumbprint Heart Cookies. Not only are they easy to make, but they are festive and cute for any Valentine’s Day parties or just because. They are a perfect mixture of light and sweet! 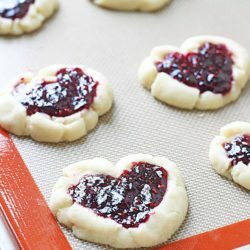 If I share the recipes for these awesome Raspberry Thumbprint Heart Cookies, will that make up for the year-long hiatus we have taken from blogging? *please say yes* I can’t believe it has been that long, but I can’t tell you how needed it was. 2016 was not a fun year for us. Our sweet baby boy was born and that was glorious and still is. He is an absolute angel. But other than that, it was really, really, hard. Zach and I think we had a bout of seasonal depression at the beginning of the year and couldn’t figure out why we weren’t over-the-moon happy when everything in our life told us that we should be. The entire winter felt like it was either snowing or had 60 MPH wind gusts here in good ol’ Cheyenne. It was rough. Then our daughter decided to go on a sleep strike and was waking up anywhere between three and nine times per night. Yeah. Nine. It was insane. And it wasn’t just waking up, it was waking up and screaming for up to two hours. I don’t wish that on anyone. It has gotten better, but even just two nights ago, she had another episode and was up for two hours straight just crying and screaming, not able to let anything console her. So miserable. Those are just a few of the things worth mentioning. Long story short, we are happy to be back and are grateful for your patience with us! Hopefully some of you are still willing to support this little blog, but we understand if you got tired of waiting. We are sad to see you go! But probably not as sad as you would be to know that you missed out on these yummy cookies. You know those Knott’s Berry Farm cookies with the jam in the middle? Those are what these taste like, except these are more festive and actually more delicious. Not to mention, they are so easy to make. Also, they don’t have any egg in them, so you’re welcome to snitch as much dough as you want! Don’t worry. I won’t tell. 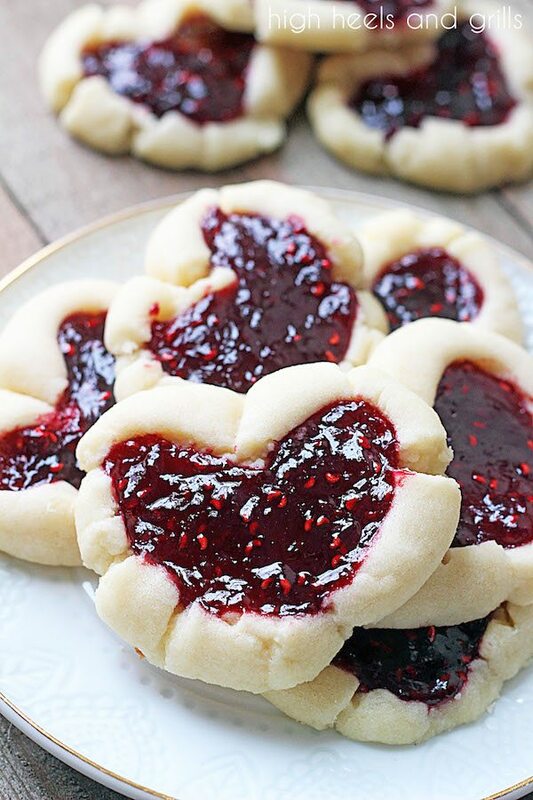 The fun thing about these Raspberry Thumbprint Heart Cookies is that you can add any jam flavor that you like and it becomes a totally different cookie each time you make it! This is especially great when it comes to allergies and such. Make these, fall in love with them, and then come back and tell me all of your feelings about them. Cream together the sugar and the butter. Add the almond extract and mix. Add the flour, 1/2 cup at a time, completely mixing in between additions. Roll the dough into 3/4-inch balls and place two, side by side, on a cookie sheet. Press your thumbs into the balls and taper them down and into one another, to create a heart shape. Further mold into a heart if you need to help it along. Spoon 1 to 1&1/2 tsp. of the raspberry preserves into the thumb imprints. Would the recipe have to be adjusted to use seedless raspberry jam? do you make with black raspberry preserves? 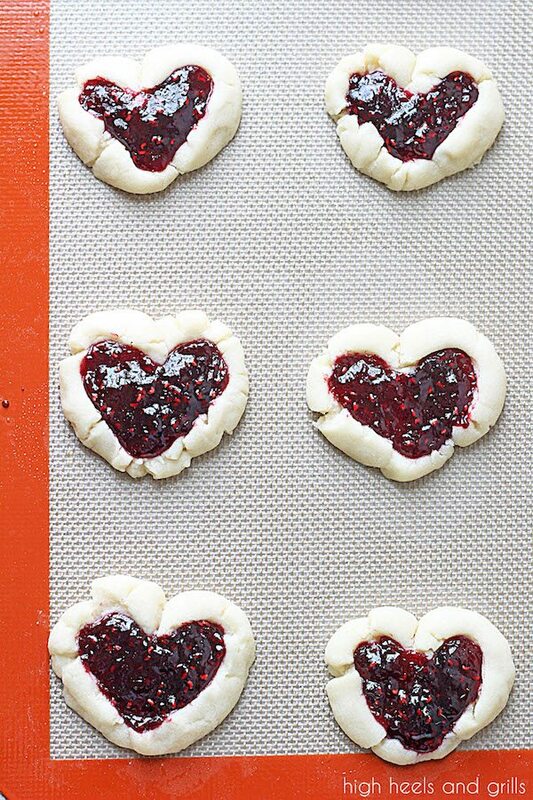 Wow these heart cookies looks yum! The Raspberry topping makes it best!